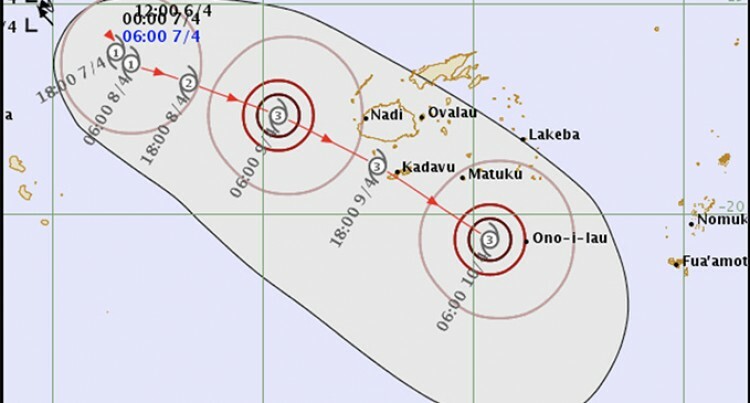 A t 12pm yesterday, TD13F was located 15.3 south latitude and 171.3 east longitude or about 710 kilometres west-northwest of Nadi and 690 kilometers west-northwest of Yasawa-i-Rara. It is intensifying and expected to develop into a Category 1 cyclone within the next 6 to 18 hours and is likely to move southeastwards towards the Group. As such, a tropical cyclone alert is current for the Western Division. This means that gale force winds at 65kmhr is expected by tonight over the Western Division. Conditions are favourable for the system to develop as it moves over open waters, and we could see it reach Severe Category 2 in the next 48 hours. It has the potential to further intensify to a Category 3 cyclone over next 72 hours as it tracks closer to the Group and passing close to land areas on Tuesday. Tropical cyclones have behaved erratically, when encountering land masses, thus the possibility of making a landfall cannot be ruled out at this stage. 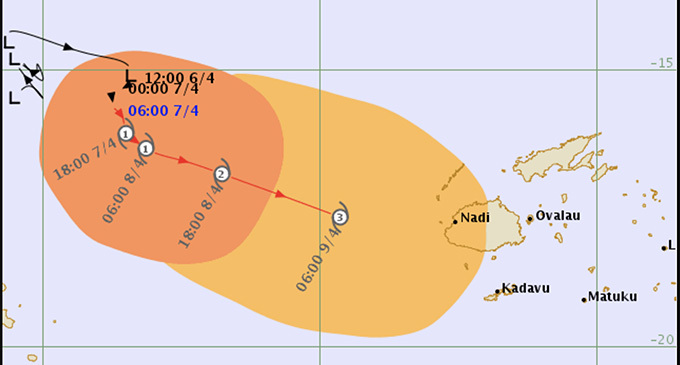 Therefore, the expected system poses direct threat to Fiji at this stage. We will closely monitor this, and alerts and warnings will be updated accordingly. Strong northwesterly winds with average speed of 50km/hr and momentary gusts to 75km/hr are expected over the Western Division. Winds may further increase to damaging gale force winds from Sunday night with periods of heavy rain and squally thunderstorms. Consequently, flooding including sea flooding of low lying coastal areas is expected from tonight. For Vanua Levu, Taveuni and nearby smaller islands and northern Lau Group, expect strong northwesterly winds with an average speed of 50km/hr with momentary gusts to 75km/hr. Periods of heavy rain and squally thunderstorms is expected over most places. Localised heavy falls may lead to flooding. For the rest of Fiji, expect moderate to fresh easterly winds with winds gradually turning and becoming northwesterly winds from today. Periods of heavy rain and squally thunderstorms is expected over most places. Meanwhile, the active trough of low pressure with associated cloud and rain continues to affect the Group. The north-western Viti Levu is experiencing rain, heavy at times and this is going to continue through the weekend and into early next week. There will be some breaks in heavy rain today but it will return as TD13F moves closer. Note: the past cyclone track may be adjusted on the basis of later information. The forecast track is considered the most likely based on the information available at time of analysis. There may be other possible future tracks. 5. A “Flood Alert” remains in force for low lying areas and areas adjacent to major rivers of Fiji. For Yasawa and Mamanuca Waters, southwest Viti Levu Waters, Vatu-i-Ra Passage, mariners can expect northwest winds of 20 to 30 knots gusting to 40 knots with rough to very rough seas. Winds may further increase to damaging gale force winds with high seas and damaging heavy swells from tonight. For the rest of Fiji waters, expect easterly winds 20 to 30 knots gusting to 40 knots with rough to very rough seas. Winds are expected to gradually turning and becoming northwesterly from today. All communities living in low coastal, flood prone and low lying areas are reminded to take all necessary precautions as a tropical cyclone threatens the country in the next few days, similarly for those living in landslide prone areas need to remain vigilant. Members of the public are advised to remain updated with the latest weather information and take alerts and warnings seriously.